The President Hotel in Bantry Bay accommodates guests in scenic sea- or mountain-facing luxury suites during your beach holiday. 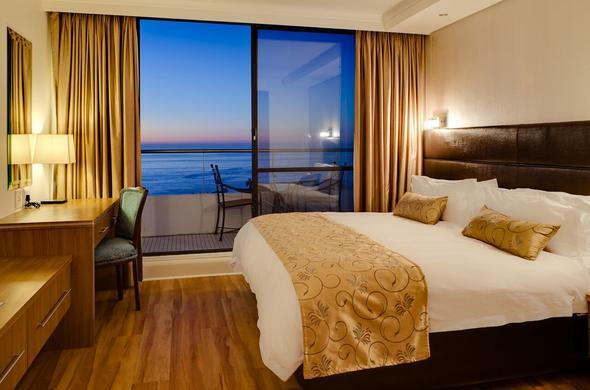 This Bantry Bay accommodation comprises 349 luxury rooms and suites, situated on the beachfront. Guests can choose between a sea- or mountain-facing rooms as well as having twin or double beds. The types of rooms offered include standard rooms, one bedroom apartments and two bedroom apartments with one or two bathrooms. The President Hotel has 3 universally accessible rooms for physically disabled guests. All of the rooms and suites have tea and coffee making facilities, remote controlled satellite TV, hairdryer, telephone, sleeper couch, individual air-conditioning, electronic room safe, ADSL plug point and wireless Internet.